This article argues that the five major countries of the Anglosphere — Australia, Canada, New Zealand, the UK, and the US — are governed behind the scenes by a coterie. This coterie shapes historical events, accounts for the near-uniformity of these five countries’ political developments, and enjoys partial or full control of most nations of the world. As far as we can guess, this coterie is comprised of a few banking families and their allies and subordinates in the information, corporate, military, intelligence, secret society, and “religious” worlds. This coterie and its members go by such names as the deep state, One Bank, bankers, oligarchs, Directors, Men in the Shadows, Owners, or Princes of Power. In this series, I shall refer to the entity itself as the Invisible Government and, following Aldous Huxley, to its head honchos as the Controllers. 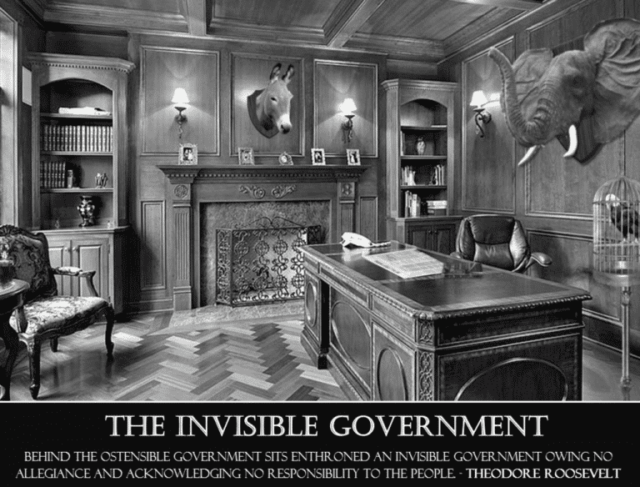 Why Prove the Reality of the Invisible Government? I’m not aware of any near-conclusive proof for the existence of the Invisible Government. This article attempts to close that gap. Also, most people are not even dimly aware of the Invisible Government. And even the few who are awake can still be mesmerized by the charade of elections, still subscribe to the fiction that the president of the USA is elected by the people (in reality, he is selected and disposed of by the Controllers), still look upon said president as an independent actor, still talk about him as “the most powerful man in the world.” They fail to see a simple truth: It doesn’t matter who the president of the USA is, who sits in Congress or on the Supreme Court, who performs for the mainstream media or organized religion. It doesn’t matter who writes for the New York Times, who recites at National Public Radio, who avers whatever in any of the major think tanks. All these people are jumping jacks. 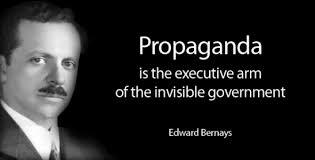 Hopefully, proving the reality of the Invisible Government will help some people extricate themselves from the Controllers’ pervasive propaganda. But, you may wonder: Is it conceivable that so many people mistake puppets for puppeteers? Hollywood provides a trivial illustration. Most movie watchers know the actors, but few know the controllers behind the camera: producers, scriptwriters, and directors. I shall explore elsewhere the profound strategic implications of shifting our focus from the puppets to the puppeteers. If mercenaries are invading your republic, your most logical target is their financial sponsor. Once you effectively shine the light on, impoverish, arrest, intimidate, or assassinate this sponsor, the looting of your country will cease. Likewise, reformers and revolutionaries must shift their attention from the likes of Monsanto, British Petroleum, President of the United States, Senior Senator from Arizona, Governor of Wisconsin, or Chancellor of Germany, to the handful of their financial sponsors. More than 90% of the actual wealth in the world today (real and paper) is hidden from us. How wealthy are these Oligarchs? Not only are these Oligarchs wealthy enough to be able to hide their names (and fortunes) from all public scrutiny, these trillionaires wield enough power to even prevent the word “trillionaire” from being recognized as an official word in our dictionaries. Nielson then identifies the Controllers’ with the Rothschild clan. For my part, I have been trying to fathom the Controllers’ identities for a long time. I’ve read many competing speculations but never encountered a definitive answer. So I have some vague notions about their identity and suspect that somehow the Rothschilds and the Rockefellers (Rs&Rs) are involved. Apart from that, I can only offer a few queries. To avoid assassination, the Controllers typically rely on proxies, shadows, and surveillance mirrors. As we shall soon see, besides the Rothschilds, the Rockefellers sit atop an immense web of regimentation. So, are the Rs&Rs collaborating as equals? Are they competitors? Or are the Rockefellers merely the American agents of the Rothschilds? (not farfetched—the “mighty” J.P. Morgan was a Rothschild agent). Above the ordinary billionaires, way up in the stratosphere, Nielson says, are the trillionaires. That could be another way of identifying the men in the shadows: Do the Rothschild and Rockefeller clans control trillions? Does the Catholic Church? Do British or Dutch royalties? Do some secret societies? The intelligence agencies, the police, the armed forces of the USA, UK, Israel, and allied countries, have a license to kill, and they could perhaps do away with the bankers and become the top dogs. Why don’t they? How do the Controllers keep these Praetorian Guards in line? It’s important to note, however, that our limited information about the Controllers’ identity in no way invalidates our forthcoming conclusion that the Controllers, conniving in the background, are the real power brokers. Humans have always known that water exists, even though they were often ignorant of its constituent parts. The same goes for the Invisible Government: Truth-seekers have excellent reasons to believe it exists, although information about its internal structure and the identity of its members remains as elusive as they are. The first quote is from an outraged journalist (in those bygone days when some mainstream journalists defended truth and people). The next two are from high-level captive intellectuals. Governed either by or on behalf of the people who fleece us, we cannot be surprised to discover that all public services are being re-engineered for the benefit of private capital. . . . The financial sector exploits an astonishing political privilege: the City of London [London’s financial district] is the only jurisdiction in the UK not fully subject to the authority of parliament. In fact, the relationship seems to work the other way. Behind the Speaker’s chair in the House of Commons sits the Remembrancer, whose job is to ensure that the interests of the City of London are recognised by the elected members. So, we have it straight from the Psychopath’s mouth: It’s Rockefeller and his lackeys—and not the nominal governments—who are conspiratorially developing their “plan for the world” and who possess enough power to do so. If they get their way, we shall become the slaves to conscience-less bankers like David Rockefeller and to such “intellectual” flunkeys of theirs as Kissinger, Brzezinski, Friedman, Greenspan, and Sachs. 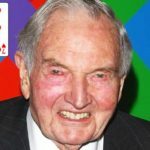 Given this web of subjection, given the Rockefellers’ 140-year-long dominance of American politics, it seems reasonable to suppose that the Rockefeller clans belongs to the exclusive club of world puppeteers. Near-identical policies suggest that the same entity(s) is pulling strings everywhere. At times, the Controllers are careless, treating us to such bizarre spectacle as the “heads” of Canada and Australia reciting the same speech. Is it conspiratorial to suppose that they were reading a speech handed to them by someone possessing more power than they could ever dream of having? That grotesque uniformity applies to all key policies of the Anglosphere and its colonies. They all fight “terror” and are subjected to “terror,” they all deliberately and needlessly impoverish and poison their people, they all pay lip service to environmental stewardship—while steadily undermining the physical and biological foundations of life itself. Or take the curious case of Crimea. Any decent person who knows what really happened in the Ukraine since the 2014 CIA regime-change operation would agree that the people of Crimea—mostly anti-fascist Russians—had a right to secede from Ukraine and join their historical Russian home. Instead, the official policies of all Western countries is that this act of Russian “aggression” calls for nuclear brinkmanship that could cost—deliberately or accidentally—the lives of billions. Only a central authority controlling all these countries could bring about such suicidal compliance. How far would the Controllers go to achieve their stated goal of “full spectrum dominance,” using the USA as their primary tool? 1. Neither the USA nor any of its allies is under the remotest threat of being invaded or encroached on by anyone. 2. 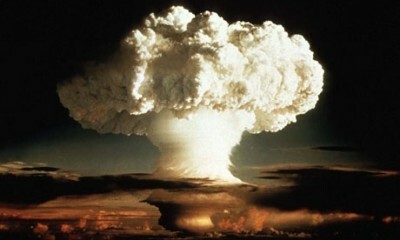 The Controllers plan to enrich and empower themselves by investing $10,000 dollars of each American’s household money on weapons of mass destruction (like the one shown nearby). Couldn’t the average American put that money to better use elsewhere? 3. The Controllers probably have underground cities to wait out the aftermath of multiple explosions. Do you have a similar hiding place? 4. Does their striving for power justify the killing of billions and the possible extinction—accidental or deliberate—of humanity? 5. Why, in heaven’s name, do ordinary people take such irresponsible brinkmanship lying down? So I had a friend, Nick Rockefeller, who was one of the Rockefeller family. . . . And one of the things that we used to talk about . . . the goals of the banking industry — not just the Federal Reserve System but the private banks in Germany, and England, all over Italy, all over the world — they all work together, they’re all central banks. . . . And so, the ultimate goal that these people have in mind is the goal to create a one-world government, run by the banking industry. . . there’ll be no more cash. . . . And I used to say to him that I never really did that because that wasn’t where I was coming from. As much as I like you, Nick, your way isn’t my way, we’re on the opposite side of the fence. I don’t believe in enslaving people. It was just a lack of caring. And that’s just not who I was. It was just sort of cold. Roughly 2½ years ago, readers were introduced to a paradigm of crime, corruption, and control which they now know as “the One Bank.” First they were presented with a definition and description of this crime syndicate. That definition came via a massive computer model constructed by a trio of Swiss academics, and cited with favor by Forbes magazine. The computer model was based upon data involving more than 10 million “economic actors,” both individuals and corporations, and the conclusions which that model produced were nothing less than shocking. The One Bank is “a super-entity” comprised of 144 corporate fronts, with approximately ¾ of these corporate fronts being financial intermediaries (i.e. “banks”). According to the Swiss computer model; via these 144 corporate tentacles, the One Bank controls approximately 40% of the global economy. The only thing more appalling than the massive size of this crime syndicate is its massive illegality. 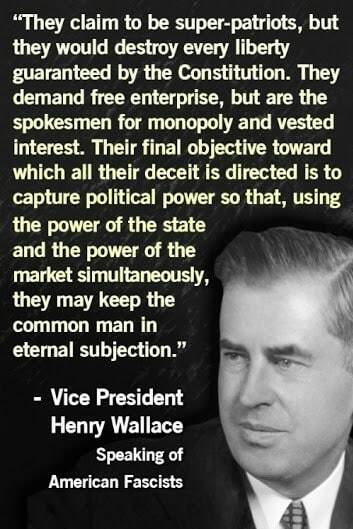 Attentive readers will notice that there is nothing new under the sun: This computer model echoes what Huey Long said 84 years ago. The golden rule of politics states: He who has the gold, rules. Wouldn’t the owners of ill-gotten almost everything use their wealth to rule the world? Another example is provided by a U.S. Congressional report, entitled “Too Big to Jail: Inside the Obama Justice Department’s Decision Not to Hold Wall Street Accountable.” This report proved that—“despite criminal wrongdoing as insidious as supporting major drug cartels and catering to states considered enemies of the United States”—certain Big Banks are above the law. That is precisely what you would expect from a Department of Justice that is ruled by the very individuals it is obligated to put behind bars. If the Invisible Government exists, then its control of government and information sources confers upon it a license to sideline, smear, incarcerate, or kill, its influential challengers. This subject has been covered extensively elsewhere; for the moment we only need to mention that 4 of the 12 people cited in this posting for hostile criticisms of the Invisible Government were probably assassinated: Presidential candidate Huey Long, muckraking journalist David Graham Phillips, Congressman Louis McFadden (“heart attack,” having survived two earlier assassination attempts), and Congressman Larry McDonald (airplane “accident”). Four others in this list died or were incapacitated comparatively young: Ex-President Theodore Roosevelt died at age 60, President Wilson was incapacitated in office, age 62, President Franklin Delano Roosevelt died in office (years after surviving a coup attempt) age 63, and Aaron Russo died of cancer, age 64. On the other hand, activist Upton Sinclair died at age 90. Henry A. Wallace died at 77, Oscar Callaway at 74, and NYC ex-mayor John Hylan died at 67. All four were viciously smeared by the Rockefeller media. Thanks to those media and the Controllers’ power, the last three were unceremoniously evicted from the political world. These data are certainly more consistent with the existence of an all-powerful Invisible Government than with its absence. The Rockefellers and Rothschilds (Rs&Rs) hand-pick a few shrewd yet acquiescent individuals to positions of political power (e.g., Rockefeller stooges Kissinger or Brzezinski) or, in all likelihood, help some people become billionaires (e.g., Bill Gates, Mikhail Khodorkovsky). In return, the politicians promise obedience and the billionaires undertake to toe the line and never, ever, share their excessive wealth with the people. Some of these handpicked billionaires—unlike their cautious masters—are kept in the limelight while promoting their masters’ agenda (so that, if push comes to shove, they, and not their benefactors, will be pitchforked). In Russia, the Rs&Rs created, out of thin air, a few plundering oligarchs. One, Mikhail Khodorkovsky, was powerful enough at one point to challenge a popular, democratically-elected, government. There’s no doubt about Soros’s great influence on US foreign policy. In an October 1995 PBS interview with Charlie Rose, he said, “I do now have access [to US Deputy Secretary of State Strobe Talbott]. There is no question. We actually work together [on Eastern European policy]. Why is Soros spending a fortune establishing a variety of organizations, mimicking his “successes” in Europe? For one simple reason: to buy political power. He is intent on destroying national borders and creating a global governance structure with unlimited powers. From his comments directed toward Viktor Orbán, we can see he clearly views national leaders as his juniors, expecting them to become puppets that sell his narrative to the ignorant masses. . . .
Soros alone, it would appear, wields more power than America’s Congress, President, and Supreme Court. Moreover, is it just a coincidence that Soros carries out David Rockefeller’s stated agenda? [In 2015] came the triumphant visit to Congress by Israel’s rightwing prime minister . . . Congress put on a truly revolting display of sycophancy, servility and brownnosing . . . that included 23 rapturous standing ovations. This is neither the first time, nor the worst: In 2011, in a disgraceful, shocking, display of subservience, the thoroughly corrupt Netanyahu received 29 standing ovations. Why are these politicians openly betraying humanity and the American people? The intrigues of one minor billionaire, working probably with the explicit or tacit consent of the Invisible Government, provide a partial answer. Cutthroat oilmen, moneychangers, and despoilers of everything: John D. Rockefeller Sr. and Jr.
As Americans . . . wonder how the country became enslaved to the highest healthcare costs in the world, we turn back the pages to look at how the modern medical paradigm came together in the early 20th century, courtesy of the Rockefeller Foundation and their cronies. [The healthcare industry came into being] “as a result of a concerted and carefully plotted plan that was laid out generations ago by people with malice of forethought. . . . By taking over the medical industry in 1910 through studies which he made through the Carnegie foundation, John D. Rockefeller emerged as the kingpin of the medical monopoly in the United States. And he now presided over an allopathic system of medicine, controlled through every legislature by accreditation of hospitals, control of physicians, control of medications and which is essentially what we have today. . . . Interestingly enough, the Rockefellers control every major drug company in the world, and when I say control, I mean directly. . . . I think we understand that profit isn’t in and of itself a motivating driving factor for the David Rockefellers and others of the world. . . . America became the most expensive healthcare system in the world . . . through methodical planning over the course of generations by people with almost unthinkable amounts of wealth. Using alcohol as an alternative to oil would actually drive down food prices, help enrich the soil, and have a lot of other benefits. . . . So if alcohol can provide a cheaper and better fuel than gasoline, why doesn’t anyone talk about it today? Well, John D. Rockefeller, under the ruse of Christian temperance, gave 4 million dollars to a group of old ladies and told them to fight for Prohibition (they successfully used the money to buy off Congress). Why? Rockefeller owned Standard Oil, the main company pushing gas as an alternative fuel to alcohol. By getting Congress to pass Prohibition laws, Rockefeller eliminated his competition. William Hearst remarked: “The newspapers control the nation.” The Controllers understood that, and wisely decided to subvert most information sources. After all, why should criminals who can print as much money as they wish, steal national gold hordes, manipulate governments, and possess a license to sideline, steal, defame, and kill, have to put up with inconvenient truths? Why should they have to tolerate the likes of David Graham Phillips writing in a main circulation magazine about their crime syndicate? The wily Rockefellers rose to the occasion, with the sad result that most people—intellectuals included—remain clueless because they read newspapers, listen to radio, watch television, go to school, and study “history” books. We may note in passing that only one in a thousand sees the obvious: As in the case of cyanide poisoning, the only way to prevent brain poisoning is to avoid exposure. In March, 1915, the J.P. Morgan interests, the steel, shipbuilding, and powder interest, and their subsidiary organizations, got together 12 men high up in the newspaper world and employed them to select the most influential newspapers in the United States and sufficient number of them to control, generally, the policy of the daily press. . . . They found it was only necessary to purchase the control of 25 of the greatest papers. An agreement was reached; the policy of the papers was bought, to be paid for by the month; an editor was furnished for each paper to properly supervise and edit information regarding the questions of preparedness, militarism, financial policies, and other things of national and international nature considered vital to the interests of the purchasers. I really look with commiseration over the great body of my fellow citizens, who, reading newspapers, live and die in the belief that they have known something of what has been passing in the world in their time. I was determined to get something done about the atrocious conditions under which men, women and children were working the Chicago stockyards. In my efforts to get something done, I was like an animal in a cage. The bars of this cage were newspapers, which stood between me and the public; and inside the cage I roamed up and down, testing one bar after another, and finding them impossible to break. Every seeker of compassion and rationality since then would recognize Sinclair’s cage as her own. Moti Nissani is the compiler of “Revolutionary’s Toolkit.” This article first appeared in The Greanville Post.